Good evening! 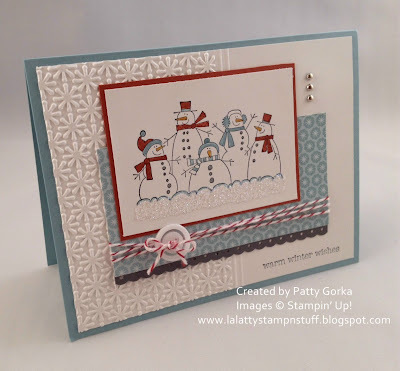 This week's 52 Christmas Card Throwdown blog challenge found here, is a theme challenge and the theme is snowmen. I love snowmen cards! I used a retired stamp set called 'The More the Merrier'. I sort of worked backwards on this card. I began with my image and then as I was coloring it I picked out the colors I wanted to use, then I found some designer series paper that I thought sort of resembeled little snowflakes through it. I embossed the left side of my background using the snow burst embossing folder and then using my simply score board I added 2 score lines after the dry embossing and I left the rest of my background unembossed so that I would be able to stamp my sentiment on a smooth portion of the card stock. Thank you so much for stopping by and taking the time to visit my blog, I hope you like my card! See you tomorrow! I started my christmas cards in January and then I stopped. You are making me want to continue. Love this colour combo!!!. For a moment I though that the image was from Flaky friends but it is not. I have it so I'll probably use that one!!! LOVE IT!!! Very pretty snowman card, love the embossing, great texture! This is gorgeous. I love the layers of interest. Patty, this card is so pretty! I love those snowmen! Love your card Patty. The snowmen are so cute, the glitter is perfect, and I like the way you partially embossed the white background. I love it! The colors are so pretty and I like your idea of scoring lines where the embossing folder stops. That's a great idea!! I might have to CASE this!! It's gorgeous!! Love the colors! !